Be the man to stand out from the crowd. Break the clutter of everyday life. Stand up tall, put your chest out and walk with confidence. If you're athletic, you have a natural talent for sports and fitness. You might jump nonstop through a strenuous aerobics class, then go run a few miles, and top it off shooting hoops with the basketball team. If you're a champion speed skater, you've most definitely got an athletic build, and while skinny jeans may not look so great on you, you probably look pretty good in running shorts. You know the ancient Greeks loved athletic competitions — after all, they invented the Olympics. Fittingly enough, the word athletic goes back to the Greek word athlein, meaning "to compete for a prize." All athletes work hard on the field and by working hard, they look good. Many people live by the saying, “work hard, play hard.” Once an athlete has worked hard on the field, once the game is over it is important for them to feel good about themselves, whether the game ended in victory or defeat. The Port Authority Pique Knit Polo gives athletes the chance to enjoy and relax at their post-game reception, while still appearing sporty and also classy. 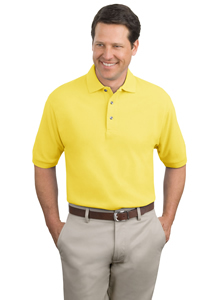 This Polo weighs a significant 7 ounces as it is made from 100% ring spun combed cotton heavyweight pique (preshrunk). It’s garment washed which gives it maximum comfort levels. It’s double-needle stitching throughout gives the polo a thick layer, so it’s both comfortable and very warm for a shot sleeve polo. A flat knit collar and cuffs give it a professional look, while the horn-tone buttons included give the polo an extra dimension adding a touch of class that makes it shine above the competition. The locker patch again shows a sense of class and elegance, where the professional image of you, the wearer, again shines through. The side vents allow for air to be circulated easily around the body while wearing a thick polo. Adult sizes range from XS-6XL, accommodating any body size or shape. The Port Authority Pique Knit Polo comes in a wide variety of diverse colours which include: Athletic Gold, Bark, Black, Blueberry, Burgundy, Classic Navy, Dark Green, Faded Blue, Faded Olive, Forest, Ivory, Khaki Heather, Light Blue, Light Pink, Navy, Orange, Oxford, Pistachio, Purple, Red, Royal, Seafoam, Steel Grey, Stone, Sunset Red, Turquoise, White and Yellow. This polo is also ideal for lacrosse, golf and tennis teams who are looking to bulk buy in order to have their uniforms looking professional for any upcoming seasons.